Good morning.... It's Friday at last and even though this has been a 4 day week its been a busy one! This card must have taken literally a year to make as I coloured in this panel last summer and it has sat in my "not sure what to do with" pile since. I decided to use it to make a couple of simpler cards by trimming it down. 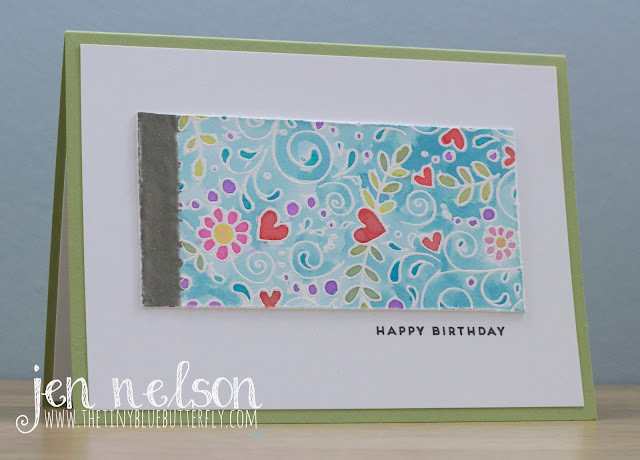 I heat embossed the Happy Flowers background from Taylored Expressions in white embossing powder and then coloured it in with Tim Holtz Distress Oxides. After splitting the panel into two I added a strip of pewter embossing powder to the end of the rectangle before mounting it onto a white card panel. The sentiment is from Tiny Type set from CBS. The white panel was then mounted onto Pear Pizzazz card stock from Stampin Up. For the second card I used the same supplies but added the panel in a different position and another sentiment from the Tiny Type set. I'm hoping I make it to a gig in Birmingham tonight and then will have the long drive home after it. Tomorrow I'm off to Happy Stampers @ Port Sunlight and looking forward to catching up with some crafty friends there!